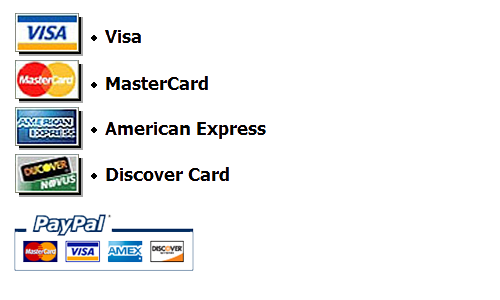 These discounts are applied, automatically, to your order during the checkout process. The discounts can be applied to ANY combination of signs throughout our store. $9.99 Flat Rate Shipping: We are SO proud to learn that our special flat rate shipping policy has become such a popular hit with our customers. It's simple and straight-forward with no gimmicks or hidden handling charges. Here's the deal: You pay a single basic shipping rate of $9.99 per order, ANY SIZE of order, whether it's for a single sign or a hundred of them. That's it! When this modest flat rate charge is combined with our standard high volume discounts (starting with every 2 sign order or more), the accumulated savings can be a powerful enticement. Go prove it to yourself by playing around in our shopping cart for a couple of minutes. Witness the dramatic savings cut deeply into your final order total with the addition of each new sign to the cart. In fact, we've tested almost every scenario. If you purchase as few as 4 of our signs, in ANY combination of sizes, your order total including shipping will ALWAYS turn out to be LESS than the base total of the signs themselves before any discounts are applied. In other words, our discount system awards you the equivalent of FREE SHIPPING and THEN SOME! for any order of 4 signs or more. We invite anybody to investigate our competitors to see if they come anywhere close to matching this deal. And, even better, this is our STANDARD pricing policy offered 365 days of the year. Enjoy! A Note About Communication: In an effort to adhere to our strict anti-spam policy, we like to limit the number of our outgoing email notifications. You will receive an initial order confirmation, automatically, after having first placed an order. The next email that you will receive from us, about two weeks later, will be a shipping confirmation with a tracking number. We appreciate that this two week wait time can seem like forever ... but, please trust us, we haven't forgotten about your order! We will be checking on its production status on a daily basis. Do not confuse our quiet "outbound" email policy with a lack of interest or support. We LOVE nothing more than to interact with our customers when they choose to initiate such communication. Please feel at liberty to email us at anytime, phone us at anytime or, better yet, make it even more personal by leaving a post on our Facebook page that we can respond to in a more casual setting. We can await the arrival of your signs together! 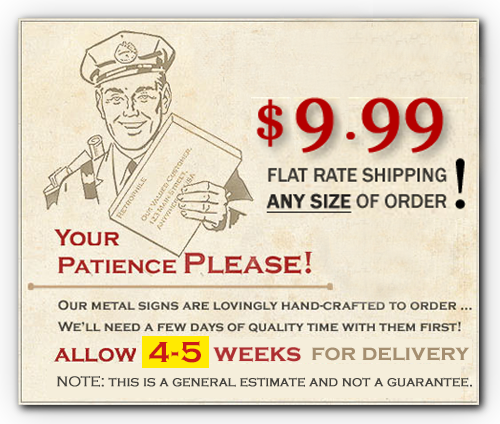 When ready for delivery, your sign(s) will be shipped from the 89706 zip code. At that time, you will be sent a shipping confirmation email with a tracking number. Retrophile is the parent company of American Yesteryear. We are very committed to our high standards of customer service; as a small company, it is our PRIMARY objective. Each of our signs is hand inspected before it is offered for sale. We take every measure to package our deliveries so that they will safely arrive to your destination in pristine condition. However, once a package is turned over to our third party shipping agent, we can no longer be held responsible for the quality of efficiency of that delivery service. Fortunately, our track record has been generally superb. In rare cases resulting in package loss, damage or delay, we sincerely apologize, in advance, on their behalf of our carrier. And, rest assured ... American Yesteryear will do everything possible to resolve the issue and MAKE IT RIGHT! That is our commitment to you, our valued customer.